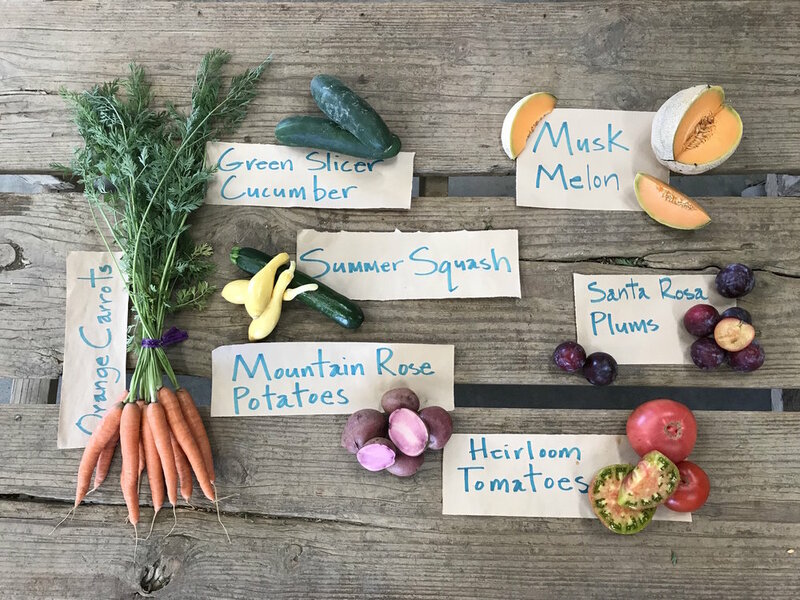 Box Notes: Sweet peppers, basil, arugula and melons – it’s the time for the overlapping of seasons, when the deep colors and flavors of summer and fall become available all at once. It’s a feast for the eyes and appetites! Field Notes: Mild weather has landed in the valley. Evenings have become chilly and the daytime temperatures are hovering around 85 degrees. The smoky air has finally cleared from the fires. We’re getting incredible night sky views with the planetary alignment of Venus, Jupiter, the moon, Saturn and Mars in an arc over the western horizon just after sunset. To learn more about this phenomenon, visit: http://earthsky.org/astronomy-essentials/visible-planets-tonight-mars-jupiter-venus-saturn-mercury. In this region, there are very few nighttime lights so the star and planetary visibility is vivid. The Milky Way can be seen with the naked eye and shooting stars happen with increasing frequency in August and September. Nighttime on the farm is a great time to witness the wonders of astronomy in our midst. Come to the farm, bring a potluck dish to share, enjoy farm-grilled pork sausages, take a tour of the farm, feed the pigs, and pick a pumpkin to bring home. RSVP to the farm by 10/15/18 with the number attending: csa@riverdogfarm.com.